We possess an extensive collection of Cassrol which can be purchased in diverse sizes and attractive colors. 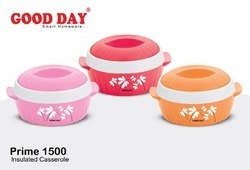 The special quality plastic material used to manufacture this range helps in enhancing the durability of the product. Our clients can avail from us customized solutions for this range as per their application requirements at leading industry prices. 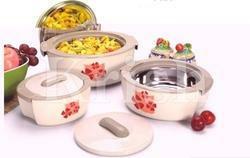 Stainless steel Hot Pots (Casseroles) are also available in Sets, Packed in attractive gift Boxes. Available in 3 Pcs set, 4 Pcs Set. Individual Sizes available are from 200, 500, 1000, 1500, 2500, 3500, 5000, 7500, 10000, 12500, 15000 and 20000.Set Can be made any Combination as per buyer requirements. Keeping in sync with the latest market norms and policies, we are indulged in providing a high quality range of Wooden Casserole.